The most popular destinations on the Internet are sites that let visitors do everything. At Yahoo! you can read news, find a date, research cars, and check the weather, among myriad other tasks. Shoppers at Amazon can buy almost anything. These Internet behemoths, sites like Wikipedia, MySpace, and MSN, span millions of pages in a bid to capture visitors’ attention as long as possible. There is, however, a growing and unusual phenomenon where site authors pursue a different approach. Many people have created sites that span merely a single page and do one thing—or nothing. These sites, which writer Jason Kottke termed “single serving sites” in February 20081, capture visitors’ attention for a fraction of a minute, a tacit acknowledgement of the economy of attention in which they operate. In this space they express many traditional messages that have found an emerging new form of expression on the Internet. Dozens of tiny, single serving sites provide a venue for pop culture references, inside jokes, art displays, collective action, bids for peer approval, humor, and advice. Collectively they offer a perspective on the web as a platform for a unique brand of storytelling. To illuminate this trend, I will offer a definition of single serving sites and discuss a categorization system that covers most single serving sites (SSS). Then I will present data I assembled on trends of SSS, and discuss their role and context on the Internet. Single serving sites cover a wide range of subjects but share three necessary characteristics. First, a SSS has a dedicated domain name like www.example.com. Second, it has a narrowly defined purpose (if any). Third, its message or purpose is expressed through a single webpage. Based on these criteria, I compiled a corpus of 130 SSS from other lists and through independent exploration. Though not exhaustive, this list includes all of the most well known sites. Note: since I published this piece a number of people have contacted me with additional sites (currently 256 sites total). I have added them to my list, but I have not yet updated the charts and data. I archived a copy of the initial set of sites I studied. Beyond this basic definition, these sites also share other characteristics. They tend to have longer domain names. Of 130 SSS in my (original) corpus, the median domain name length was 15 characters (mean 16.6, std. dev. 7.3). This is nearly twice the length of most popular sites. Based on data from Alexa, a company that compiles data ranking websites’ popularity, the median length of the domain names of the 100 most popular sites in the United States in November 2008 was seven characters (mean 7.0, std. dev. 3.3)2. Additionally, SSS domain names contain far more verbs than traditional sites. Of the Alexa top 100 domains, only 7 contained verbs while nearly a third of SSS names contain verbs. The preferred domain extensions for SSS is .com, with over 86% of sites using that extension. Others in use include .org, .info, .net, .us, and .asia. Visually, sites’ presentation is often as sparse as the domain names are long. Many display only a few words. Although some sites use Flash to play an audio or video clip, very few offer the rich interactivity associated with Flash deployment in other contexts. Some sites incorporate design tropes from past online eras: gaudy 3D headlines, jarring repeated background images, looping audio clips, and centered text. Some sites have obvious utility, like whatsmyip.net, which tells you the internet address of your computer, and umbrellatoday.com, which gives you a one-word weather forecast on the probability of rain. These are decidedly in the minority, however. In most cases, people might characterize SSS as humorous, funny, or clever, but they are equally likely to consider them useless, dumb, pointless, or stupid. After looking at the general traits most SSS share, I attempted to sort them into a set of categories based on their purpose or operation. Once I had an initial set of categories, I classified all the sites in my corpus as a test of robustness and made some revisions. For example, I initially created a multimedia category since many sites simply play audio or video clips. It became apparent, however, that this characteristic was non-orthogonal to the others categories; some multimedia instances were pop culture references, others were interactive, and some were artistic expression. I abandoned multimedia as its own category. This left me with six categories: status sites, question sites, pop culture, information and instruction, advice and commentary, plus a selection of oddball sites which defied simple categorization. The Hamster Dance was one of the first single serving sites. Some of the most well-known single serving sites take popular culture as their subject, whether by reference existing elements of pop culture or by creating it. 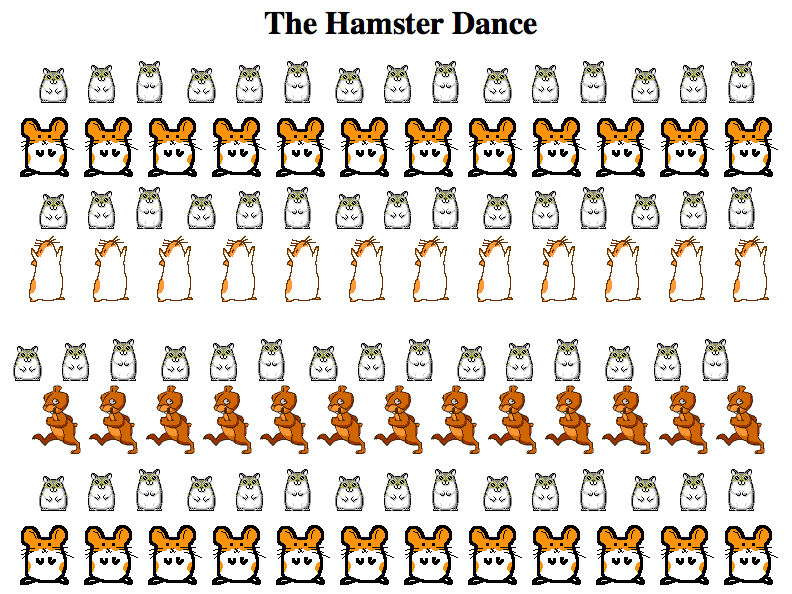 One of the first SSS, webhamster.com, showed an animated GIF display of dancing hamsters accompanied by techno dance music. 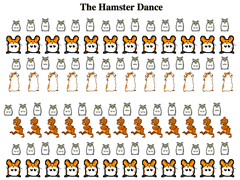 This built on a popular Internet meme from 1998 known as the Hamster Dance.3 Material for references include lines from movies, characters from television shows, technology, and politics. (Palinaspresident.us), for example, presented a satirical vision of the Oval Office if occupied by Alaskan Governor Sarah Palin. A typical implementation in this category is yourethemannowdog.com, which shows a picture of Sean Connery and loops a clip of his line “You’re the man now, dog” from the movie Finding Forrester. A handful of sites make obscure references to movies or TV shows that only insiders would understand: itsnotlup.us is a line from the television drama House, godsdamnit.com from the science fiction program Battlestar Galactica. I have also placed some sites in this category which popularize elements of a subculture or create a new element of pop culture. The most salient example is the Your New Bicycle meme, which is responsible for a significant number of SSS. On February 13, 2008, Mathew Honan created the site barackobamaisyournewbicycle.com after joking with his wife that her love of Barack Obama rivaled her love for cycling. Each time the site loads it says something nice that Barack Obama did for you like “Barack Obama remembered your birthday,” or “Barack Obama offered you his seat.” The site was well received after it launched, with news articles circulating on the Time blog and other sites. In the next 10 days, 11 other sites riffing on the your-new-bicycle idea were registered. First there were takes on other politicians (hillaryclintonisyournewbicycle.com, johnmccainisyournewbicycle.com, ronpaulisyournewbicycle.com) and other people (stevejobsisyournewbicycle.com). Later twists included a general purpose site isyournewbicycle.com, where you can enter your own name in the subdomain, an ironic subject type shift (cannondaleisyournewbicycle.com) and an object shift (hillaryclintonisyournewhddvdplayer.com). One site which otherwise seems to be a non-sequitur, whatdoesthisnewproducttastelike.com, is obviously a derivative of the Bicycle meme based on its visual styling and random display. The final contribution to the bicycle meme was georgewbushwreckedyournewbicycle.com. While the original site was a unique creation, subsequent creations were derivatives that helped to establish Your-new-bicycle as a fixture in pop culture. Another common set of SSS are status sites which provide a yes or no answer to a question of changing status or availability. One of the earliest examples was islostarepeat.com. This site indicated whether the episode of Lost playing during the current week was a new broadcast. Other status sites report on availability of online services, like the downtime-plagued messaging service Twitter (istwitterdown.com) or Apple’s online store (isapplestoredown.com). Later downforeveryoneorjustme.com generalized this approach, allowing visitors to specify a website to resolve whether a site was legitimately down or was affected by local connectivity issues limited to the user. Some sites correspond to conditions in the world: whether Paris Hilton is currently incarcerated, whether the U.S. is currently at war with Iran, or whether John McCain is president. 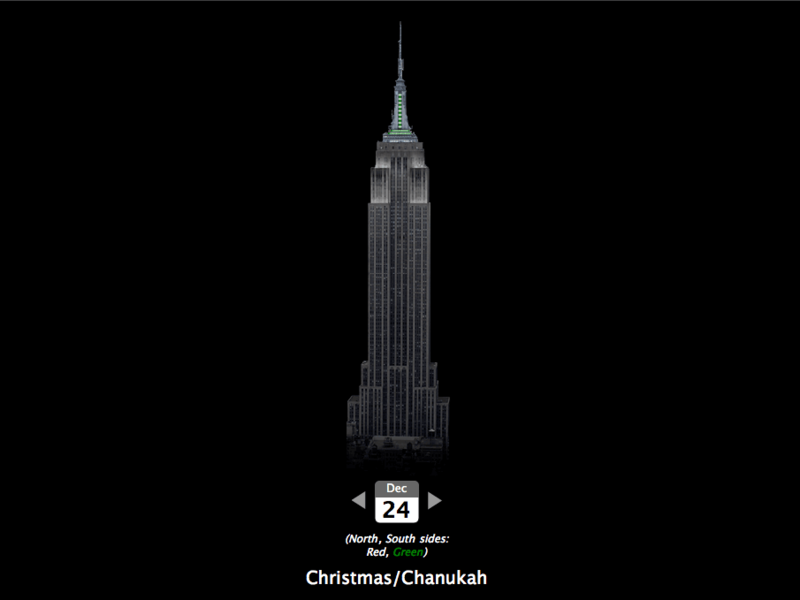 One status website shows what color the dynamic lighting on the Empire State Building will be on a given day. Though nearly all status sites offer a yes or no answer, not all do. 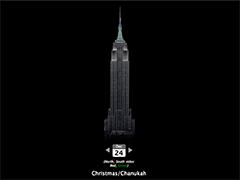 Whatcoloristheempirestatebuilding.com is properly a status site because it reports the current arrangement of the Empire State Building’s lighting. Some status sites have obvious utility, while others have nearly none: isittuesday.com, isitchristmas.com, and isitaleapyear.com. Question sites are closely related to status sites, and their names often take the same form. The distinguishing feature is that the answer these sites provide is not expected to change. Contrast isobamapresident.com, a status site, with isbarackobamamuslin.com, a question site. While Barack Obama’s status as president can change, he will never be muslin. Some question sites may offer judgments in their answers, like shouldiusetablesforlayout.com, which addresses whether it is acceptable to design webpages using the <table> feature for page layout purposes. Other sites offer information or instruction about simple objective data, like the weather, the visitor’s IP address, the number of U.S. troops killed in Iraq, or the spelling of certain words. This information need not have to be definitive, as evidenced in a collection of cooking sites like howtobakeapotato.com and howtocutapineapple.com, which may not provide the authoritative method for these tasks. Commentary sites offer an opinion, advice, or an editorial take on the Internet. At one end of the spectrum, the commentary is unambiguous like ignoreanncoulter.com (a blank page with the word, “Please”) or fuckinggoogleit.com, an expression of frustration that the creator gives to people who are “an idiot because [they] were too stupid to check Google before asking a question.” At the other end are sites whose message is not obvious, but appear to offer commentary in some fashion. Showmesomeads.com may be a take on the increasing commercialization of the Internet. Some sites which I considered commentary may not be because they are contingent on knowing the creator’s real intentions. Outside these basic categories, a certain subset of single serving sites seem to defy attempts at categorization. They may be non sequiturs or purely random. Sometimesredsometimesblue.com is, well, just that. Thispeanutlookslikeaduck.com presents a convincing argument. A few showcase one-of-a-kind ideas. Thesheepmarket.com was a project where the organizer paid individuals $0.02 each to make a line drawing of a sheep. The site collected 10,000 such drawings and displayed them on a single page. Visitors can purchase selections of these random sheep. Letsturnthisfuckingwebsiteyellow.com, which looks innocuously yellow, was a collective action project where one pixel on the screen turned yellow for each visitor to the site.4 A few sites are what is conventionally recognized as Postmodern art: Iwanttofeel.com is a video featuring a ballerina in a pink tutu dancing in a warehouse with a grass-and-brick floor, while “Moon River” plays in the background, and a man delivers a monologue about life and having been diagnosed with Alzheimers. A certain subset of single serving sites seem to defy attempts at categorization. Given the variety of sites, I thought an interesting approach would be to look at a timeline of site creation to find possible trends among them. When someone creates a new domain name, its creation date becomes part of its public record stored on domain name servers. To view this information users can run a program called whois, which retrieves a domain’s public record.5 This record lists the domain’s contact person, its registration date, and its expiration date. Using a program to automate whois searches, I retrieved the initial registration date for each of the domains in my corpus. One caveat in this process is that a domain name’s registration may not coincide with content appearing at that address. Registering a domain is like buying a plot of land, and putting a website there is like building a house. There may be a significant delay between the two since many people and companies register domains far in advance of making a site publicly available online. Technically, then, a domain’s creation date only provides a lower bound for the date the site first appeared online. They may be the same day, but they could be months or years apart. However, based on the limited content that appears on SSS, and the fact that many sites participate in Internet memes and consequently their authors want to release them quickly, I believe that there is a short turnaround time between a domain’s registration and the site’s launch. In short, the creation date is an accurate indicator for the approximate date at which a site was launched. Once I collected the registration dates for each site’s domain, I sorted the data into bins for each month. Then I used this to plot the number of known SSS as a function of time. The results are shown in figure 1. Figure 1. 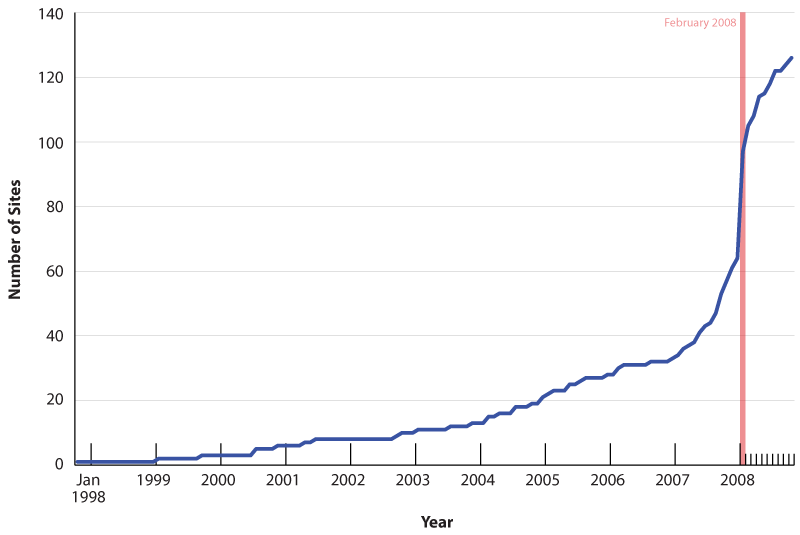 The number of single serving sites over time. During the late 1990s and the early 2000s, before the idea of single serving sites had been identified, sites that fit this trend appeared sporadically at the rate of three to five a year. At the end of 2006, 31 sites had been registered. By the end of 2007, that number doubled to 61. As we near the end of 2008, that number has doubled again to 130. In particular, there is a pronounced period of growth in February 2008. In the year preceding February 2008, 31 SSS were registered, a rate of just less than 3 per month. An equal number have been registered in the nine months since February 2008. This yields a slightly increased rate of creation. Due to the small values and the uncertainty that the corpus I assembled accurately captures all SSS, these differences are insignificant. What happened in February 2008? Upon inspection, this particular inflection point represents a confluence of circumstances. Some of this growth can be attributed to the Your New Bicycle meme, which began around February 13. Another possible factor is that naming something increases people’s awareness of it. On February 15, 2008 influential blogger Jason Kottke wrote an article in which he noted the phenomenon and coined the term “single serving site” to describe it. Only 9 sites were registered during the 30 days prior to Kottke’s article. In the subsequent 30 days, 26 sites were registered. Having presented these data, the most interesting and difficult question remains unanswered: why? As a whole, the SSS movement may be a commentary on the hyper-specialization of sites. Although the most trafficked sites on the Internet remain those with broad functionality, the recent history of the Internet has been one of increasing specialization. YouTube is the site for video, Flickr for pictures, Delicious for collecting bookmarks, MegaUpload and others for swapping files, and so on. With the proliferation of specialized sites increases, SSS have extended this concept to its logical extreme: sites dedicated to performing a single, ultra-specialized function, or none at all. Clearly some market conditions contributed to the environment where SSS could thrive. In 1999, domain name remained a monopoly, and registering a .com domain with Network Solutions cost $35 for a year. Now customers can register domains with a variety of providers at prices that range from free to $10 a year. The amount people will pay to make a joke or participate in a trend obviously varies, but it seems likely that there is some threshold for many between $35 and $5 that makes dedicated domain names more tenable. Most websites generally aim for short, memorable domain names, but most single serving sites have longer names. This may be a reaction to or commentary on available names. Due to the explosive growth of the Internet and tactics like domain name speculation, the namespace for short domains has become so crowded that even popular sites like the wine site Cork’d and photography site Flickr adopted misspellings of necessity.6 SSS may be a response to this reality that most short names are already taken. Once domain names grow to the size of sentences and questions, many more options become available. Though it is difficult to state or assert in an objective manner, some people may also find a certain degree of humor in verbosity. One factor that clearly motivates SSS creation is the ability to participate in a loosely connected network of creativity. Media that predate the Internet offer some manner of interaction: magazines and newspapers accept letters to the editor, people can discuss material in local communities, and talk radio allows listeners to call in. The democratized nature of publishing on the Internet allows consumers to become producers on a dramatically larger scale. Additionally, the fast-paced and interactive nature of the medium further allows users to give feedback and produce derivative works rapidly. Niche sites like icanhascheezburger.com and YTMND.com, which let visitors submit pictures of cats with humorous captions and Flash animations respectively, create an environment where people can subject their creativity to peer rating. Single serving sites support this model of derivative creativity, a point which seems particularly salient when considering the high number of SSS based on similar concepts, whether the Your New Bicycle memo, or question and status sites in general. Single serving sites allow people to showcase their sense of humor or make a joke on the world stage. Even if only a select group of people actually do navigate to a site, the fact that millions of people could see the site changes the nature of the creation in ways that we are only beginning to understand. The only information at yetanotheruselesswebsite.com is tucked away in the page's HTML source. Although the nature of the Internet means that SSS appear on a global stage where anybody can see them, the purview of SSS is still limited to a relatively tiny audience. Even the most popular Internet memes are less well known than standard fixtures in popular culture. This emphasizes the interaction that a site creator seeks with her peer group. From a creator’s standpoint, the technical knowledge required to make a SSS is beyond most people’s ken. Consequently, creating a site may be a sign of status within a group, or a signal of membership in a community of like-minded technical individuals. This is supported by the fact that many of the SSS I visited contained messages and notes as hidden comments in the HTML source of the page. When present these comments included details like the creator’s name or website, how the site was implemented, or ASCII artwork associated with the site. By their very nature, only a select group of visitors will ever view them, but this group’s attention is that which creators are most interested in attracting. Work in this direction may offer us a better understanding of SSS creators’ motivations and the social psychological incentives surrounding this twist on the standard mechanisms for expression, even in the novel space of online communication. 1 Kottke, Jason. “Single Serving Sites.” February 15, 2008. http://kottke.org/08/02/single-serving-sites. 2 For a site like Google, whose address is often represented as http://www.google.com, the length of the domain name as considered here is six characters. We ignore the protocol statement and “www,” which is a subdomain, and the top-level domain “com” which the registering entity has no control over. 3 Wood, Molly. “Top 10 Web fads.” Circa 2005. http://www.cnet.com/1990-11136_1-6268155-1.html. 4 This concept is not unlike Alex Tew’s Million Dollar Homepage. 5 Most websites that allow visitors to register domains also offer Whois searches. See http://www.networksolutions.com/whois/ as an example. 6 Brignull, Harry. “Origin of the name flickr: flicker.com was taken.” September 17, 2007. http://dconstruct07.backnetwork.com/feeds/post.aspx?postid=455. 7 Twitter messages are constrained to 140 characters, making shortened URLs the preferred mechanism for sharing sites. One approach would be to create a short URL for each SSS at every URL shortening site (e.g. 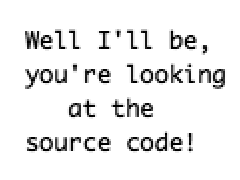 tinyurl.org, bit.ly, is.gd, etc.) and then create a timeline by searching Twitter for these short URLs. I wrote this paper for Quentin Hardy’s class, Information Technology and Identity: The Future of Storytelling, taught in the fall 2008 term at UC Berkeley’s School of Information. I welcome your feedback. Contact me if you have any suggestions or comments. For data gathering I used a set of Ruby scripts, then I used Excel for analysis. I used Adobe Illustrator to make the chart of sites over time. You can download my list of 256 single serving sites. Since publishing this piece a number of people have kindly emailed me about additional sites. I added these sites to my list, and I archived the initial list of 130 sites that I studied to write this paper. If you want to see the new sites you can run diff between the original and current file. My thanks to N.D. for taking time to discuss single serving sites with me and for offering insight about the phenomenon. © 2008 Ryan Greenberg. Some rights reserved.